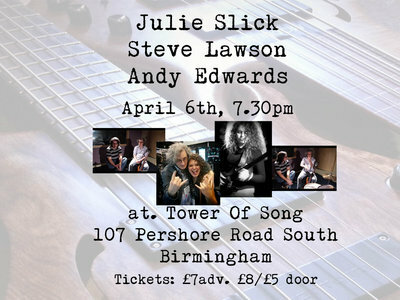 Gig with Julie Slick in Birmingham, April 6th + New Video! OK, two v exciting bits of news! First, my next Birmingham gig is with one of the most remarkable trios I’ve ever been a part of – Julie Slick, me and Andy Edwards. Andy Edwards is something of a drum legend – from Robert Plant’s band, he went on to play with many of the UK’s top prog bands: Frost*, IQ, Magenta, and is greatly in demand as a clinician. I’ve played in duos with both of them, and am excited to see what alchemy takes place with this new band. It’ll be amazing. I promise. here’s the ticket link if you missed it above. Please tell me that you’ll be sure to record this gig and make it available in some form afterwards!